Hello! One of the most popular styles of Darkroom Door stamps has been the 'Inchies' series, which includes Garden Inchies, Christmas Inchies, Travel Inchies, Seaside Inchies and now we have added a new set to this series called Steampunk Inchies! Teresa Abajo and Suzz Czosek have created some fantastic cards to show how these stamps can be used. Without cutting up the stamps into individual inchies, stamp the entire plate of Steampunk Inchies onto mint paper using Coffee Archival ink. Cut one 3x3 inchie arrangement and one 1 x 6 inchie arrangement for each of the cards. Mount these onto dark brown card. For the square card, stamp the Torn Text Background stamp onto dark brown card using Aquatic Splash VersaMagic ink. Cut down to fit a 15 x 15cm kraft card and adhere. Stamp the Grid Background stamp onto mint paper with Coffee ink, sponge with Brushed Corduroy Distress ink, tear a strip and adhere to card. Add layers of corrugated cardboard and hessian, and then the mounted inchie images. Embellish with chipboard cogs and the word from the Steampunk stamp set. Spatter with Tarnished Brass Distress Stain. For the long tall card, stamp the cogs and word from the Steampunk Stamp Set using Coffee ink onto a 10 x 21cm kraft card. Stamp the Grid Background stamp onto mint paper with Coffee ink and sponge with Brushed Corduroy Distress ink. Adhere to card under a scrap of corrugated cardboard. Add rows of stitching with the sewing machine in between each image, and allow the threads to hang. Adhere this to the card and embellish with chipboard cogs. Stamp Steampunk Inchies using brown ink on ivory cardstock. Repeat on second panel. Cut out photobooth image. Mount image on brown cardstock. Cut out words form Art De Fleur Wordstrips. Sponge edges of word and mount on brown cardstock. Die burlap panel with spray. Layer panel of Steampunk Inchies with burlap and panel of inchies and photobooth image on top. Attach words with embellishments. Stamp panel of Steampunk Inchies using Jet Black ink on white cardstock. Cut inchies out and mount on black cardstock. Stamp sentiment from Welcome Home Rubber Stamp Set onto white cardstock. Cut panel and mount on black cardstock. Attach inchies along right side of sentiment. Attach white panel to black cardstock. Attach inchies along left side. Assemble card. Hi! 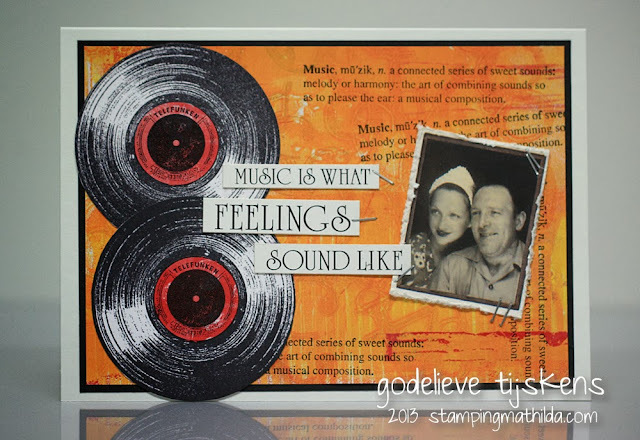 Today we are sharing cards by Belinda Spencer and Robyn Wood using the new Tree Bark Background Stamp! 1. Apply the Tree Bark Background Stamp onto a piece of smooth white cardstock cut to size using Jet Black Ranger Archival Ink. 2. Use an ink blending tool to apply Vintage Photo Tim Holtz Distress Ink to the background in a circular area to create a focal point and frame around the embellishments. Spray with a little coloured mist and allow it to run down the background. 3. Stamp some leaves from the Leaves Rubber Stamp Set onto white cardstock using the Jet Black Ink. Dry with a heat gun. Apply the Vintage Photo ink over the top. Flick with water from your fingers and then dry again with the heat gun. Fussy cut the leaves. 4. Tear an image from the Wilderness Vol 2 Filmstrip and ink the edges with the Vintage Photo Ink. 5. Stamp a sentiment from the Gum Trees Rubber Stamp Set using the Jet Black Ink. Cut out the individual words and ink the edges with Vintage Photo. 6. Next assemble the card. Add a coil of Ink Black Prima Wire Thread allowing it to tumble down the card and staple in place. Layer on the leaves, Filmstrip image and quote. Add the card front to a black cardstock base. Here is another example of how I used this fabulous background stamp in the same style but with different images and colours. Stamp Tree Bark background onto white cardstock using Coffee Archival Ink. Trim to suit card front and layer with dark green card. Select three images from the Garden Inchies stamp set and stamp onto white cardstock using Fern Green Archival Ink. Trim the squares closely. Tie some ribbon around the layered background and attach to card front. Affix Garden Inchie squares so that they are at angles to each other. Raise one with foam tape for extra interest. Create the background by putting a small amount of Squeezed Lemonade and Tumbled Glass Distress Paint onto a non-stick craft mat. Spritz with water and drag some cardstock through it until you are happy with the marbled colour. Set aside to dry well. Stamp Tree Bark Background onto the marbled background using Fern Green Archival Ink. Trim to suit card front. Add a strip of gauze to the left hand side of the background and layer with some striped ribbon. Attach to card front. Stamp large tree from the Trees rubber stamp set onto cream cardstock using Jet Black Archival Ink and trim closely. Affix to black cardstock and re-trim the shape. Attach to card front. Trim two images from the Friends & Lovers Photobooth sheet. Distress the edges and ink using Coffee Archival Ink. Attach to card front so that they are both at an angle. Attach the image at the back using double sided tape and the one at the front using foam tape. Stamp greeting from the Trees set onto cream cardstock using Jet Black Archival Ink. Add a button tied with twine to the left hand side of the wording and trim. Layer greeting with black cardstock and attach to card front using foam tape. Thankyou so much for stopping by the blog today! Hi everyone! It's Connie here today. I have a fun project for you using the Photobooth images. This is one of my truly favourite products. I find myself adding them whenever I can. This is a cute idea for a friendship gift too. 1. Make a hole in the middle of the star and screw a 7 Gypsies knob in. I used a ice pick to make my hole and then it was easy to screw in the star. This will act as a picture stand, so the star is standing. 2. Cut a Star out of pattern paper and add it to the center of the Star cap with a foam pop-up. 3. Glue the small ruler to the Star. 4. Decorate the center with an image from the Friends & Lovers Photobooth sheet. 5. The sentiment comes from various Wordstrips. You could easily stamp a sentiment also. 6. It is all glued with hot glue. The project takes less than 10 minutes to put together, once you have your supplies gathered. Hi! Belinda here today to share with you a card I created using the fabulous Typewriter Collage Stamp with lots of distressed and torn layers of book paper in keeping with the 'type' theme. 1. Swipe some gesso over a piece of book paper using a make-up wedge. Allow to dry completely. 2. Apply the Tyoewriter Collage Stamp onto the book paper using Jet Black Ranger Archival Ink. 3. Tear around the image and ink the edges with Antique Linen Tim Holtz Dustress Ink. Crinkle the paper up a bit. 4. Layer the stamped piece onto to more pieces of gessoed book paper torn to size. Ink all pieces and crinkle slightly. Stick down onto the black cardstock base. 5. Stamp some leaves from the Leaves Rubber Stamp Set onto some scraps of book paper. Scrunch up a little and then staple together with a piece of Tim Holtz Filmstrip Ribbon on top. Add a sentiment cut from a Wordstrip. 6. Place the Tim Holtz Schoolhouse Layering Stencil over parts of the card and apply some Ranger Claudine Hellmuth Studio Black Gesso using a make-up wedge. 7. Attach the leaf cluster to the bottom left hand side of the card. 8. Cut out an image from the Friends & Lovers Photobooth sheet. Sand around the edges and ink with Antique Linen Tim Holtz Distress Ink. Distress the edges and apply the Antique Linen ink again. Add to the top right hand side of the card. Staple on a couple of pieces of Tim Holtz Filmstrip Ribbon and attach a Tim Holtz Hinge Clip. 9. Cut out a sentiment using random letters from various Wordstrips. Add a Tim Holtz Stencil Type letter and tie some twine onto the hinge clip. Thank you so much for stopping by the blog and checking out my card today. Don't forget to check back tomorrow for some more inspiration from the Creative Team. Hi, Connie here with a card using the Scroll Frame Stamp! 1. Stamp (Ranger Archival black) the Scroll Frame Stamp on Kraft Glassine paper by Tim Holtz Idea-ology. 4. Add two of the Photobooth people to the center of the scroll image. 5. Make a card, double mat the card front. 6. Add the scroll image to the front. 7. Add embellishments and tie with twine. Hi, it is Godelieve here. I would like to share a masculine card I made with the Scroll Frame Stamp, together with the wonderful Sail Away Stamp Set. I stamped the Scroll Frame Stamp onto crumpled up paper, using Archival ink Potting Soil, which is a great brown ink. I stamped images from the Sail Away set onto the stamped Scroll, and cut it out. There's also a subtle print of the French Script Texture Stamp with Distress Ink Pumice Stone. I thought that Bill, the sailor from Darkroom Door's Gentlemen Photobooth, was perfect for this card! On brown cardstock I stamped the large ship of the Sail Away set. I composed the card, and finished it off with an oval diecut from Sizzix Tim Holtz Tag & Bookplates. I can imagine the Scroll Stamp with a handwritten receipe, combined with the "From The Kitchen" or "Sweet Treats" stamp sets. Thanks for dropping by on the Darkroom Door Blog today. Hello, Lynne here today with the second page completed in my art journal. 1. Randomly adhere torn pieces of vintage French book pages which are further distressed after a wash of Gesso. Randomly apply texture paste to the stencil. Once dry apply Distress Paints, spritzing with water, allowing the paints to drip down the page and blending with a baby wipe. Distress the book pages once again, peeling the paper away from the page before applying further washes of Gesso and Distress Paints. 2. Stamp small butterflies from Butterflies with Distress Inks Tattered Rose and Victorian Velvet. 3. At this stage I journalled my thoughts and feelings in regard to the quote I would be incorporating into the page. As with my first journal page (but a matter of moments) I once again applied washes over my thoughts, you can choose to leave your journaling exposed. 4. With an old credit card or palette knife, swipe Gesso onto the page in bold strokes. 5. Stamp quote from Venetian Collection Vol 2, one large butterfly and two small butterflies onto vintage dressmaking tissue. Note that I partially stamped the large butterfly to create added interest. Adhere the quote, large and one small butterfly to the page with Gel Medium. 6. Cut out image from Photobooth Ladies, slightly distress the image and abrade the edges. Also to the edges apply Distress Paints Tattered Rose and Victorian Velvet. Staple a fragment of fabric with Tiny Attacher. 7. Stamp letter from Correspondence onto a piece of watercolour paper (note:- I had this piece of watercolour paper which had previously been stained with dissolved walnut ink crystals and sprayed with homemade ink.) Apply Distress Paints to edges and adhere to the page. 8. Gather the Photobooth image and the last of the stamped butterflies. Adhere the butterfly to the Photobooth lady with Gel Medium further applying Gel Medium to the Photobooth to adhere to the page. Finally tuck a teeny piece of vintage lace beneath the fragment of fabric. * Use a brayer to ensure good adhesion of the book text. Do not use your good inking brayer as you don’t want adhesive straying onto your brayer! * Keep any fragments of fabric or lace to incorporate into your art. This is only my second page but as with the first I found that in both instances the quote stamps used were a springboard for expressing my thoughts and it is certainly freeing, writing those thoughts knowing that I would all but obliterate them with Gesso and paint. Thank you for taking the time to visit the Darkroom Door Blog. Hello, Lynne here with another page from my journal. On receiving the Floral Texture Stamp I was eager to stamp onto fabric as the design of the Texture Stamp brought to mind old textiles. However, as well as stamping onto fabric to mimic a piece of vintage textile, I also wanted to use the stamp to create texture on the actual page itself. 1. Lay down texture onto the art journal page (my pages are watercolour paper) with various found paper items from around the home. 2. Add colour with Distress Paints, chalk ink pad and water mister. Ensure the colours blend into one another, further blend with fingers. Peel away some of the papers/tape then apply more colour. 3. Stamp Floral Texture Stamp with Dark Peony ink. In some areas blend the ink with fingertips or spritz with water. 4. Apply Tattered Rose Distress Paint to paper doilies. Adhere to page layering with stained lace. 5. Stamp Floral Texture Stamp onto cotton fabric. Rip one piece slightly larger than Photobooth image. Distress the edges of Photobooth image and mat onto the stamped fabric with Gel Medium. Staple loose fibres with Tiny Attacher before adhering the panel to the paper doilies. Further embellish with lace, etc. 6. Partially ink sentiment from Wildflowers Vol 1 Rubber Stamp Set onto vintage dressmaker tissue. Tear around words and adhere to panel with Gel Medium. 7. Rip two lengths of the previously stamped cotton. Staple one length to velvet ribbon with Tiny Attacher and adhere to bottom of the art journal page. 8. Adhere the second length to the top of the page, attaching with a piece of stained/painted masking tape. Look around the home for any cotton fabric which could be utilised in your artwork. I find that cotton fabric curtain backing/lining is a useful source. Masking tape is a wonderful item to use in artwork. Keep any bundles of loose fibres, sometimes they can be a lovely addition. Extras:- Cotton fabric, Paper doilies, masking tape, vintage dressmaking tissue, lace rose, fibres and pink velvet ribbon. Thank You for your visit to the Darkroom Door Blog. Hi there! Teresa here today showing a couple of tags I made using the new Texture Stamps - French Script and Star. These new stamps are great - they are easier to handle versions of the backgrounds we love. No more masking or rolling an inked stamp for unpredictable results - you can now ink and stamp the entire image for that arty uneven edge. The script stamp is also a smaller size - fantastic for smaller projects! I started with tags made from black cardstock. I stamped the Texture Stamps with Versamark and embossed them with clear embossing powder, and then sponged some acrylic paint over the top. The rubbing motion rubbed the paint right off the embossed areas. I used these tags as a base for a couple of quotes, completing them using scraps from my scrap box and some Photobooth images. These can now be presented to a recipient as they are, or even attached to the front of a card. 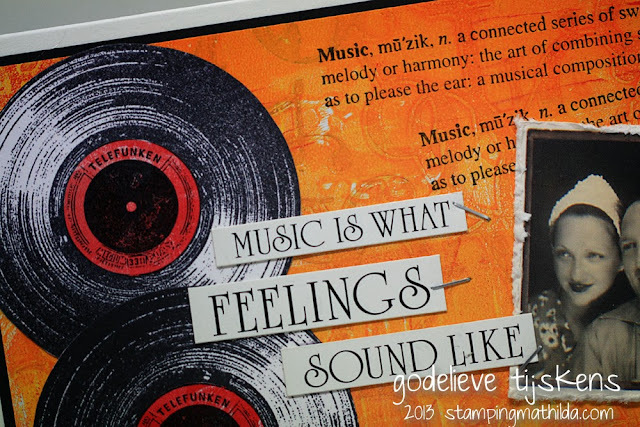 Hi Godelieve here with a new card to share using the Vinyl Record Eclectic Stamp. A gelli print was used as a background on this card. The Vinyl Record Eclectic Stamp is a new one by Darkroom Door. I stamped it with black ink on white cardstock, and again on red paper to cut out the center/label of the record. I also used a definition stamp, a Photobooth image and Wordstrips, all by Darkroom Door.